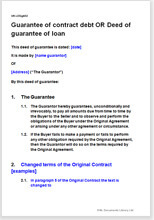 Simple agreement where guarantor steps into guarantee payment of a debt. One party has money problems. The other party refuses credit or refuses to continue his own contractual obligations. Guarantor "rescues" the first party by guaranteeing payment. Applicable to any situation where money is owed. Optional new terms suggested. This is a professionally drawn, short agreement which identifies an original contract, then ties a new guarantor to it, to stand in the shoes of the debtor, should that be necessary. Nineteen year old entrepreneur borrows from friend of family to start new business. Loan requires monthly payments. Borrower fails to meet them. His father agrees to provide “after the event” guarantee. Lender is happy and son can carry on with his business. No change to terms of original agreement. Website writer agrees to write website for new limited company. No guarantee in the contract. Before it is completed, client decides to add a great deal more work. Writer now worried about payment, so insists on directors of client company guaranteeing payment for the enlarged contract. This agreement would include adding a new schedule to the original agreement, by reference, and new schedule of payments. Builder agrees to build a house against stage payments. When house up to first floor level, client fails to make a payment as required by the contract. Builder threatens to walk out and video the story for Facebook. Client persuades brother-in-law to give guarantee of the debt as instalments become due. Builder agrees to complete the contract. In these examples, the guarantee is for a loan or debt. If you are looking for a guarantee for performance rather than payment, look at Guarantee of contract performance. The key benefit of using this document over adding a guarantee paragraph to the original contract is the simplicity of use. There is no need to edit and agree the original. That means less room for making a mistake and invalidating the original. "Very easy site. Clear and concise instruction and navigation. Very happy with the service so far." "Loved it mate, was in somewhat bitter dispute with ex partner, loads of expensive meetings nothing sorted. Got your form, edited it up sent it over -bang, signed, sealed and delivered in 10 mins. Excellent"